How many episodes of Bill Nye, the Science Guy have you seen? All right!!!!! Something educational AND fun!!!!! From 1988 until very early 1995, my family and I used to live in the Seattle area (yuck!!!!!). 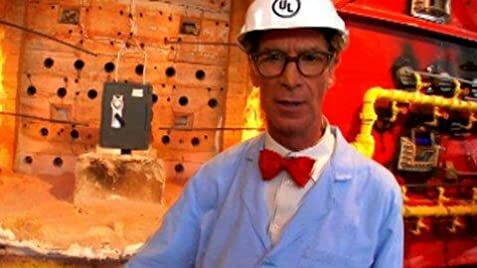 That was the setting of the very great educational Disney/PBS program, "Bill Nye, the Science Guy!!!!!" Our host, Bill Nye, showed us everything about experiments and science in a cool and fun way!!!!! It always started off at the "Nye Laboratories" door, then we go on to "The (insert many words here) of Science!!!!!" (fanfare) And here, Nye showed us how a different science is possible. We also learned many other great things from his lab to out in the world!!!!! 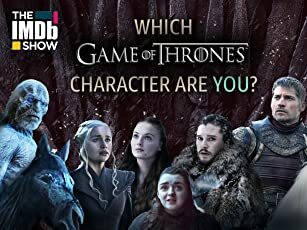 We also talk with real life "scientists," do fun experiments in our kitchen, plus there's some funny skits that tied in with, well, SCIENCE!!!!! After all of that, we wrap up the day's episode with a music video, also explaining science. I remember I was at a mall in Seattle in December, 1993, and I actually met Bill Nye at a book signing!!!!! BTW, my family still has the book today: "Bill Nye the Science Guy's Big Book of Science!!!! !," published by Addison-Wesley, in 1993. 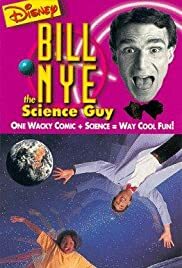 "Bill Nye, the Science Guy" was a terrific science show and probably the most academic work the Disney company has ever made in its "Golden Age." I only wish the show were on TV today, and along with my top-class private education, made me understand the universe a whole lot better. (Try THAT with "WILL OF THE BUTCHER" or whatever that bad time traveling DCOS is, LOL) Oh, and did I mention: SCIENCE RULES!!!! !